Knowing that this week would be significantly cooler than our last few weeks of highs in the 80s, I knew that I wanted to wear my black jeans and my green Fluevog oxfords. But I was stuck from there. I hate figuring out last-minute what to wear, so I looked through my closet/dresser last night, trying to figure out which top to wear. Finally, frustrated, I decided to just wear all black and let the shoes do all the heavy lifting. I dunno. This isn't the kind of outfit to wax ecstatic over, but I can't say that I wasn't pleased by its simplicity. My only complaint is this shirt: it has no stretch to it, so I'm constantly pushing up the sleeves and trying to adjust it correctly over my pants. It gets SO DROOPY by the end of just one wear. I find a long-sleeved black tee kind of a necessity, so that's why I don't get rid of it, but I'm definitely finding myself looking for excuses as to why I shouldn't wear it: maybe it's time for it to go to the donation pile...! I was excited to wear real pants today - I've been biking in leggings + dresses a lot, so it was nice to wear jeans. I tend to wear sportier shoes when I bike, but it was kind of nice to have the low heel of the Fluevogs to hook onto my pedals. I gotta say: for an outfit that barely came together in the end, I'm pretty pleased with the results. Maybe sometimes we just gotta go for the monochromatic + splash of color! On the other hand, I'm hoping to wear new/new to the blog clothes this week, so stay tuned! One of my favorite guilty-pleasure long-reads is the novel Shantaram, by Gregory David Roberts. It's supposedly based on true events and it's a fun adventure read, but it's not great literature. I bought it in India for 740 rupees when I was studying in Pune in 2004. I had brought very little reading material with me, being mindful of my suitcase, so I quickly found myself with nothing to read. I went to a bookstore with some friends and I found Shantaram, bought it, and have been devouring it regularly since then. Anyway, in the book there's one character, an Indian named Vikram, who loves the whole cowboy/Sergio Leone aesthetic and tends to dress in black with pointed-shoe cowboy boots, a hat hanging from his neck, and (American) western designs on his shirts. One character, famed for her cleverness in wordplay, says that he's the kind of person who wears "his sleeve on his heart." The narrator/main character says that he finds this kind of remark slightly unkind and confesses that he admires a person who can live out his obsession so whole-heartedly. When I bought this buffalo plaid dress last year, I had no idea how often I'd wear it. I mean I more than got my money's worth for it: it's good for biking, it's excellent as a winter layering piece... it's great. As I was going through my closet this morning, I was wondering if today would be my last wear of it, though, as I have so much in this pattern, and this silhouette isn't particularly one of my favorites. However, once I had it on, I changed my mind. Three different people complimented the whole look, and you'll be indifferent happy to know that I decided to keep it. Not much else to say about that. Back to the shoes, though, which you can't really see... I don't know. Anyone who meets me knows pretty quickly what I'm about (India, Beatles, biking...), but I like showing it, too. I like having a ukulele necklace and a lot of Beatles clothes. I like wearing my sleeve on my heart. Or, in this case, my feet. I mean, I know how to dress appropriately for any occasion: what's wrong with having a little fun the other days? Beatles sneakers: ArkhamPrints shop, on Etsy, remixed. Oof, we are experiencing our first full work/school week and it's a killer! I'm tired and grumpy and underslept and it's only Tuesday. How is it only Tuesday?! Except for the leggings and shoes, I wore this outfit almost exactly a year ago. I bought these newish leggings last spring and the Chucks have become my favorite bike commuting footwear. I know that these crazily patterned leggings and flat sneakers do no favors for my legs - they are curvy and muscular enough as it is, without being stumpified further by a problematic hem, a busy pattern, and flat, rounded shoes. But you know what? I don't care. It was very cheerful to look down at my leggings all day and I was functional and comfy throughout my hours at work. I call that a win. I'm off to collapse: have a great week, folks! These are the Ray Belted Booties and I fell in love. I have noticed in the past few years that my own aesthetic has been unconsciously admiring that new/old alt-folk look - you know, well-worn oxfords and booties and vests and maybe suspenders. The younger teaching fellows that swarm my school in the fall always look like they belong in Mumford and Sons (for a hilarious look at that fashion, check this out). In fact, I describe one of my young colleagues' look as 'Amish chic.' Because that is exactly what it looks like. 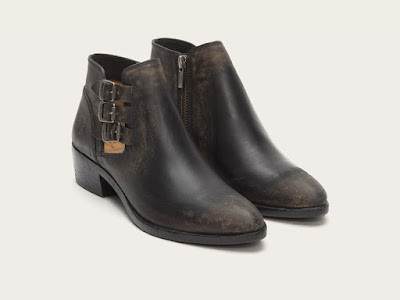 Anyway, these booties spoke to me on that primal, "maybe she's in a bluegrass band" level. I love that they're already distressed: they look as if they've belonged to one forever and gone on amazing adventures. But they also cost $328, so after admiring them wistfully on the internet, I deleted that e-mail. However. However. My husband is a very good man. He decided to buy them for me. He was going to wait until October (so that the September paycheck could kick in), but it's been a little hard at home - he has a piece due and I've been taking care of Baby Boots all by myself - so he ordered them for me last weekend from Zappos. They arrived Friday morning. They are... amazing. My husband literally gasped when I pulled them out of the box. I love them so much. I feel as if I could be in a Traveling Wilburys video while wearing them. I could hang out with George Harrison, Bob Dylan, and Tom Petty in these boots. I cannot wait to wear them and to see what I'll do with them, naturally. The weather is supposed to warm up quite a bit again this week, so it'll be a while, but, oh man, I cannot wait. Skinny jeans, skirts, leggings ... the sky's the limit with these beauties. 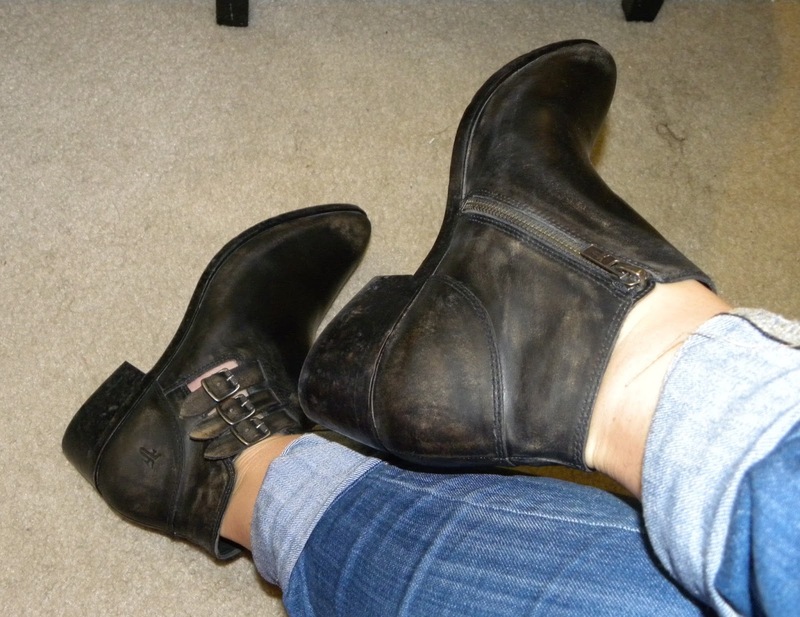 I felt so guilty about another pair of boots that I immediately donated my old black Fluevog booties. They were never the right shape for me and they were a wreck. All my outfits with them? Imagine how much better they look with these! Can't wait. I never was a kid who was crazy into pink as a little girl. Nor was I the kind of kid who hated it, rejecting all the feminine froufrou that I was supposed to like. It was just...there. I don't remember wearing much of it as a kid - probably because my mom doesn't particularly like it that much, I don't think, and she didn't tend to dress me in it. In my adolescence, like a typical New York kid, I discovered black and never looked back. But as I've grown older, I've shown a marked preference for pink accessories: my old Filofax was pink, my iPad cover is pink, and I chose a bright turquoise/pink phone case last year when I updated my cell. You saw my Marimekko dress last week and I think it's clear...I do pink, now. No comment on Baby Boots' amazing color story today. Or her bewildered expression. I've owned that striped tank top for a couple of years now - you can see it in one of my posts over a year ago, but the denim jacket is pretty recent - from the spring. The pants continue to photograph awkwardly and I think that is mostly the fault of the camera angle: if you could see my ankles, as you could in real life, the line of my legs/pants would be a little less stumpifying. Since it was cool today, I kept the jacket on for most of the day, although I did take it off when overly impassioned in class. You can't see it well, but I added a fabric rose hair clip in my bun today. Since I kept my jewelry simple (light silver pieces), I thought it would be fun to add some visual interest to my hair. I bought two of these rose clips in CVS YEARS ago...I think even before I cut off all my hair in 2011! The first time I wore one of them in public was earlier this summer, when I went to a friend's place for dinner wearing this exact same outfit. I liked the effect, so I recreated it today. And that's all, folks! I'm exhausted from our four-day week (not even a full week!) and I'm ready for the weekend to start. I have exciting boot news to share, so stay tuned! ... the long black dress, that is! I wore a lightweight linen jacket in the morning and in the afternoon, when the A/C at my faculty meeting got a little intense, but I was basically like this all day, as it was very hot and humid in my classrooms. It's the simplest thing ever, no? Just a long black dress. I think it cost me a little over $20. But, for some reason, when I wear it, I feel magical. It's flattering and hugs me in all the right places - three different female students gushed over it today, including one girl that is not that fond of me (we didn't have a great...classroom experience together). I paired it with my old moccasins, which you can't see so very well, but I promise they're there. I have some exciting boot news to share soon (sigh) and I'm already a little overwhelmed with getting back to the grind, but... we're inching closer to the weekend, so I'm feeling happy... Happy Thursday evening! You guys, it was the second full day of classes today and I am COOKED. I was able to bike commute today and it made everything bearable, as did the temporary cooler temperatures (it has been HOT here), but oh my word. Who would've thought that two full days of classes could be so tiring? As I mentioned yesterday, while I liked my back-to-school ensemble, it was missing something. Between the lack of glasses, the different silhouette, and ... I don't know ... some sort of missing ingredient, I didn't feel like myself very much. And that can be tough. But today? Hoo boy, I felt like myself. I don't know if you can tell, but there is exaggerated drapery in the waist/hip area, which would've been anathema for me in the past, but when I tried this dress on back in June, I fell in love. I took it with me to Greece and wore it about once a week, if not more often. It was definitely my "cool girl in Athens" dress. Yup, I wore my new Chucks for the very first time! They were comfy and great and all the kids really liked them. Only one kid commented on my dress, but he happens to be an amazing tailor/designer, so I'm glad that he of all people stopped to compliment my crazy drapey dress. Because I was biking today, I wore my shorter black leggings under the dress: perfect combo. Forgive the weird Baby Boots shot: she is entranced with 'Monsters Inc' and I didn't realize how odd she came out. And, yes, she is also wearing stripes. Aaaand THAT is how my head looked today. Glasses and all. And I loved it. My American reader(s), are you excited for this three-day weekend? Woot woot! Have a great one!